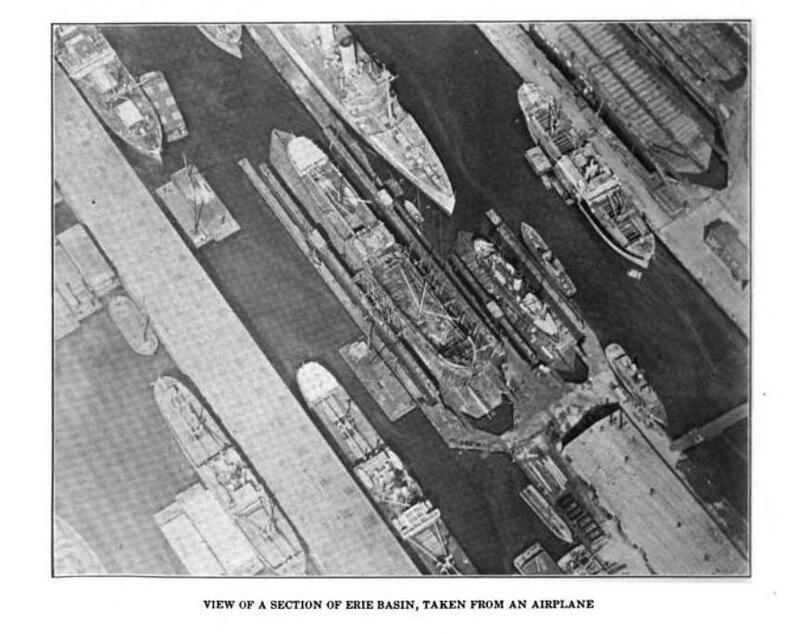 Erie Basin, at one time dubbed “The busiest place in the Port of New York” is a large man-made protected harbor near the southern point of Red Hook. Its U-shaped breakwater, well over one-half mile long, encloses a large area of water. The basin was originally a major center of the world wide grain trade, and then later of ship building and repair. Colonel Richards, founder of the Atlantic Docks and advocate of the Gowanus Canal, originally envisioned developing the area in 1830s, but it was not until the 1850s that the design and building of the Erie Basin began.Credit for that goes to Jeremiah P. Robinson, who may have made the initial land purchases, his brother George Robinson and William Beard, whose estate would own the basin for about 100 years. Jeremiah P. Robinson, started out as a lowly employee of E. P. & A. Woodruff, jobbers in fish salt and provisions, and rose to be head of the firm. As early as 1843 he had begun to buy waterfront property in Brooklyn. By the early 1850s he became associated with William Beard and the process of forming the Erie Basin began. The area of Erie Basin is made up by sections once known as “Bomjes Hook," “The Mill Pond,”“Drowned Marsh,” “Oyster Bed" and “Fishing Place," and “The Beetch.” Much of it once owned by early Dutch settlers such as the Couwenhoven, Van Cortlandt, Courtelyou families. Some of it owned for a time by Col. Richards. By 1856, through private purchases and grants from New York State, a property bounded by Van Brunt Street, Hamilton Avenue, Gowanus Creek and the water rights now bounded by piers and wharves of Erie Basin was secured. Much of the land was marsh, underwater at high tide, and the high ground was scattered with homes. The 3,700 foot long breakwater protecting the basin was made constructing and filling a large number of cribs each about 25 feet wide and 6-8 feet deep. Much of the sand and rock used for fill is said to have come from Europe as ballast on ships coming to Red Hook to load up with grain. Initially, large breakwaters were proposed for both sides of Gowanus Bay. A protected Brooklyn Basin extending from Columbia Street on the west to Court Street, appeared on maps but was never built. If it had it would have reduced the bay to a narrow shipping channel. 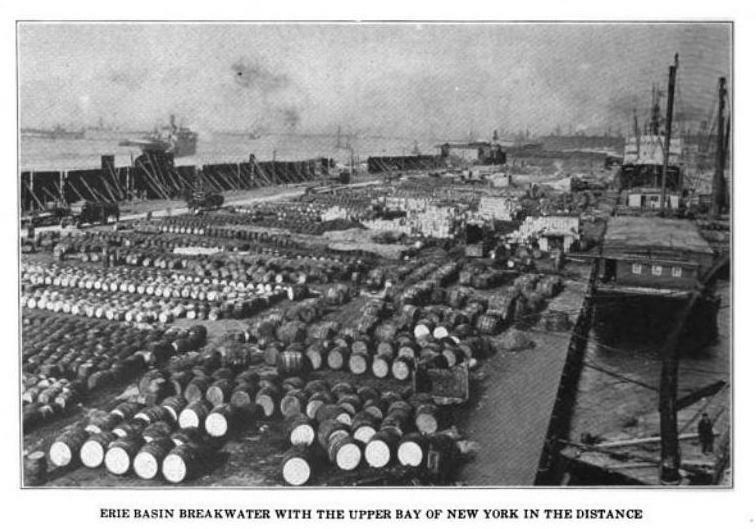 Even without the breakwaters, the area was known as Brooklyn Basin until much of it was filled in the 1920s. In 1864 Beard sold to the Anglo-American Dry Dock company the plot of land now occupied by IKEA. Two years later, to much fanfare, the company opened the first graving docks in the United States. While famous ships such as the MERRIMACK were laid up there the business was not that successful until after Handren & Robins took it over several years later. 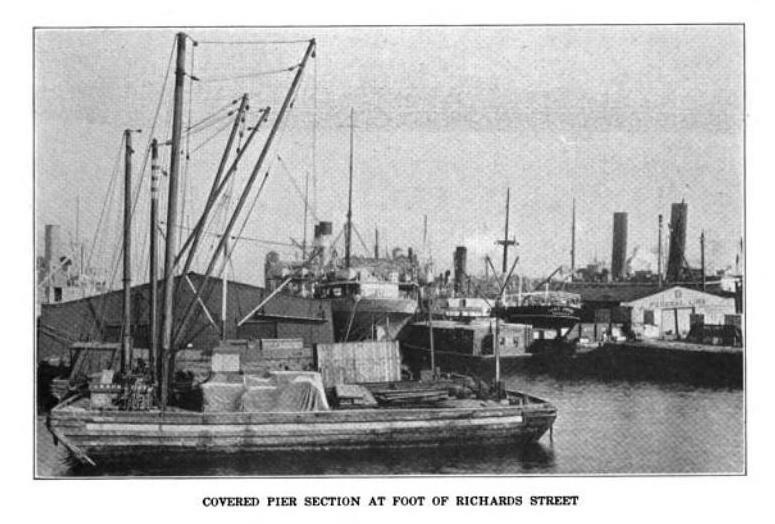 The Robins Shipyard, (Handren died soon after the company was formed) made and fixed a large number of vessels both as an independent company and later as part of Todd Shipyard, late into the 20th century. 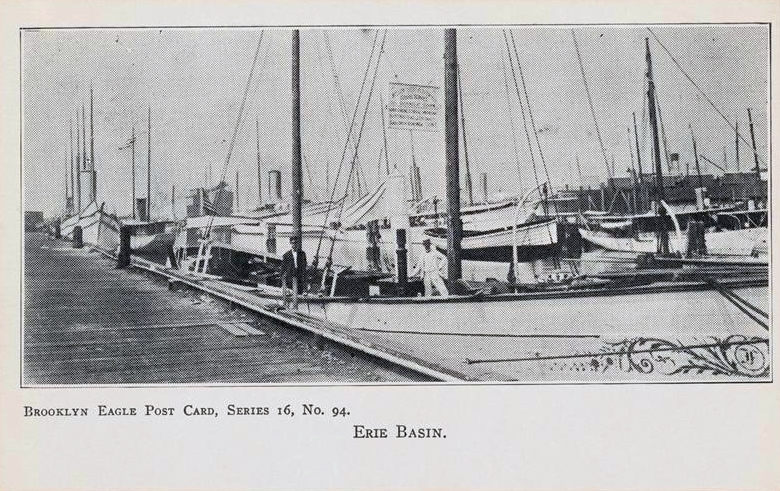 The purpose of building Erie Basin was to attract (and profit) from the shipping trade. 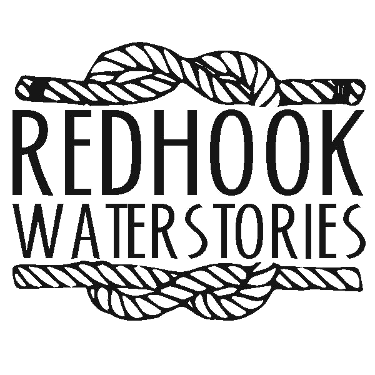 The bulk of the trade from America, and thus from Red Hook was grain. Along the Van Brunt Street side of the Basin commodious warehouses (called ‘Stores’ in Brooklyn) were built. In 1910 there was reportedly storage for 3,000,000 bushels of grain and capacity for many other articles as well. Originally two large stationary elevators dominated the shoreline. They were used to transfer grain from canal boats to the Stores and then, at some later point, to fill the holds of ocean going steamers and sailing vessels. The fixed elevators became impractical as size of the vessels got bigger and there was no room to shift them around the basin. The major culprit in the increase in size were large passenger liners, who started transporting grain both for profit and as ballast. The tall grain elevator buildings were torn down and replaced with general purpose warehouses. Their job of moving grain was shifted to floating grain elevators that could to and from ships. By about 1910, most of the basin's warehouses had been converted from grain to general cargo and shipyards occupied much of the basin. 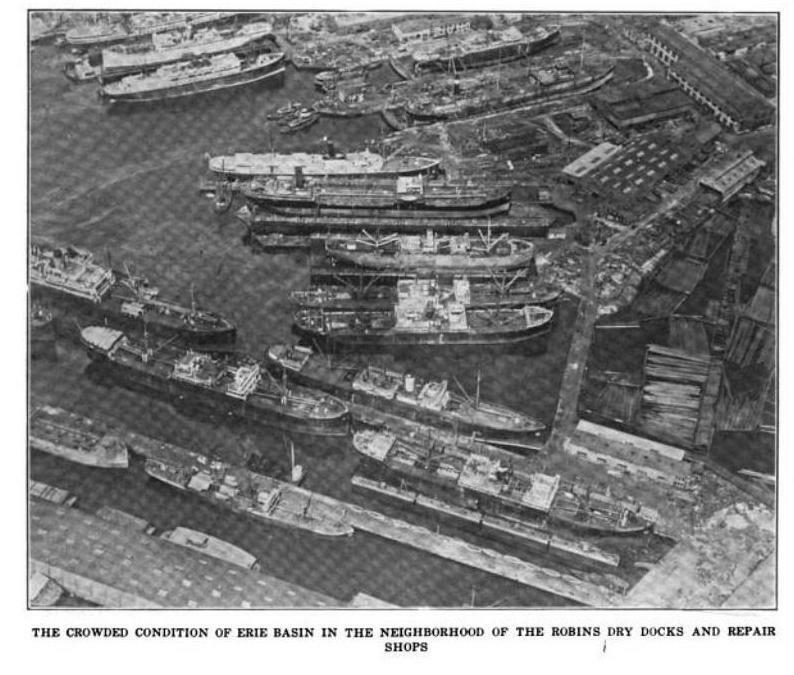 William J. Gorkey both built and utilized floating drydocks. 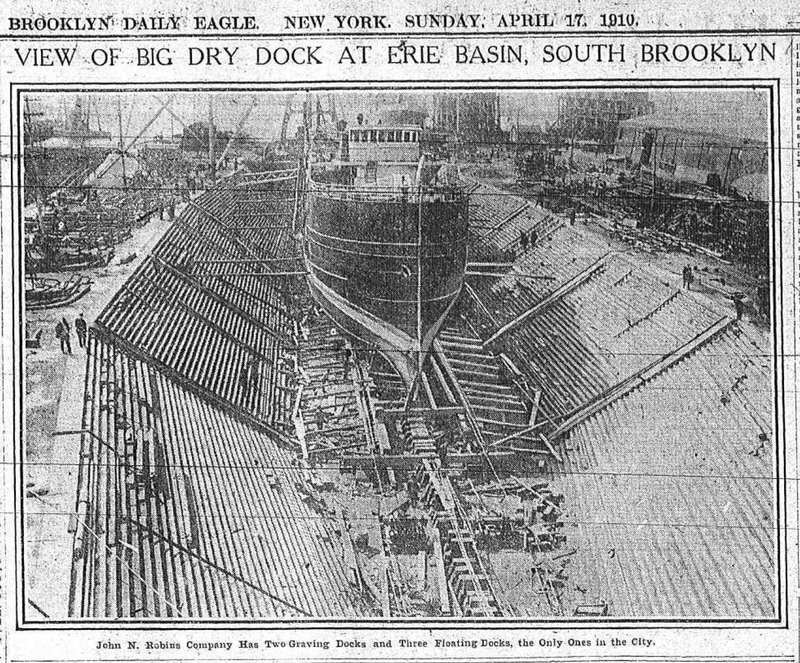 Gorkey took over his site from the Balance Dry Dock Company. Townsend Iron works, run by Rudolph Townsend, repaired ship engines, boilers and the like. 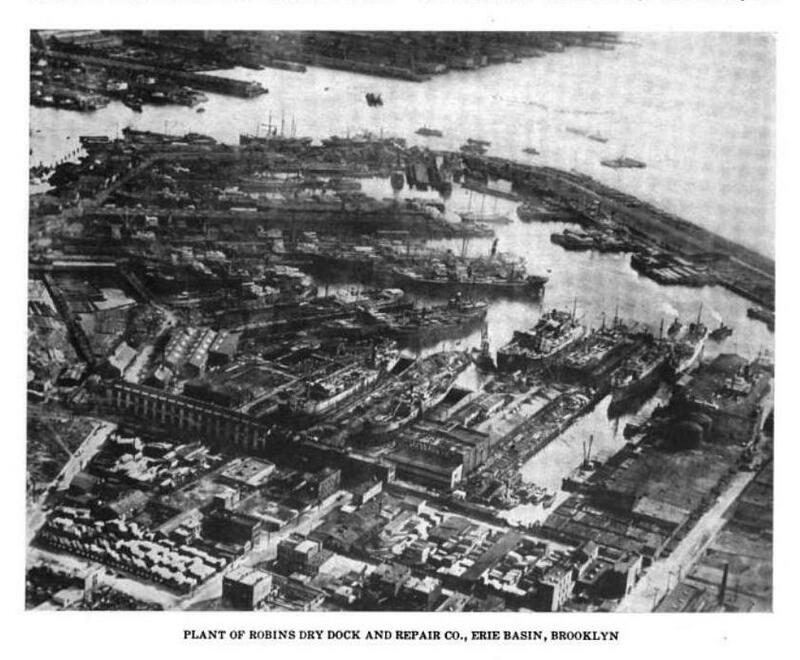 John B. Caddell also had drydocks and provided carpentry work. That site was previously occupied by the Provincial Dry Dock Company. 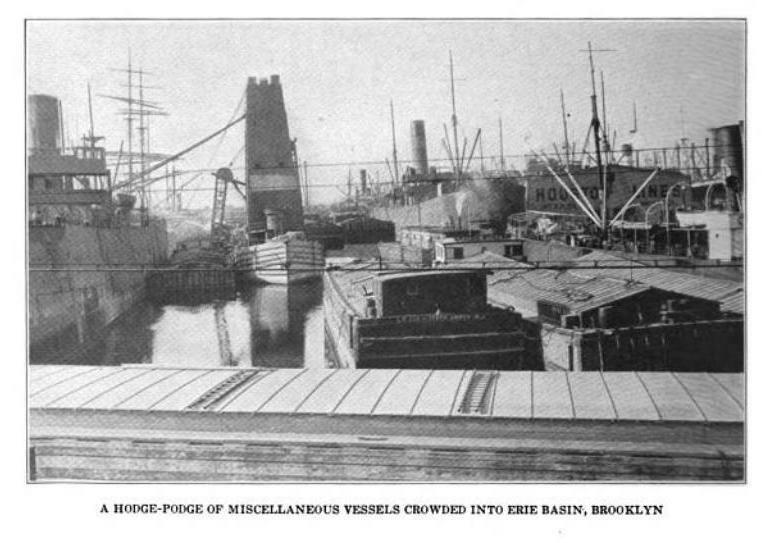 The Brooklyn Spar Yard manufactured wooden ship masts, booms and gaffs. It’s prior names were I.P. Jones, Hudson and Langill’s, and the Endner Spar Yard. Atlantic Basin Iron Works, located on the Van Brunt Street pier, was also in the ship repair business. Gilbert H. Edgett & Company, a builder of engines and repairer of vessels, located at Otsego and Van Dyke Streets. Recently closed by 1920, White and Price were once makers of engines popular among tugboat men. The Brooklyn Fire Brick Works, makers all kinds of ﬁre brick, tiles, tubes, etc. (The Port Authority Report notes that “ the original proprietor of the plant was Adam Brick, in whom the original William Beard took a kindly interest and assisted in establishing the business. The shipping and warehousing business of the Beard Company declined through the 1900s. Trains, trucks and the greatly diminished need for transported goods to be parked in dockside warehouses cut deeply into the profits of the company. 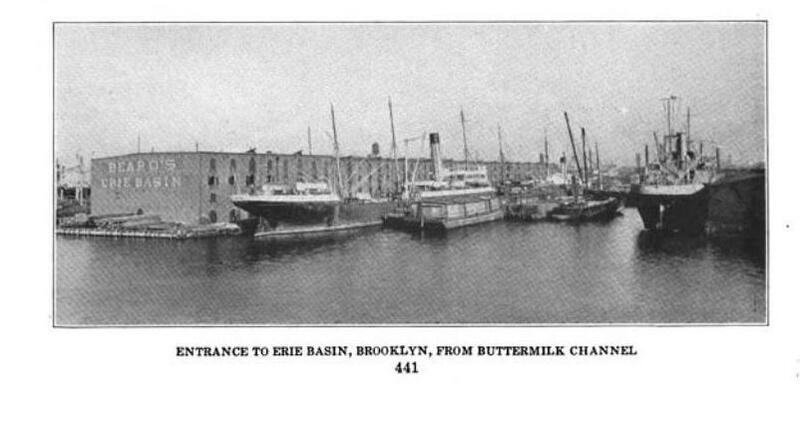 The Erie Basin was sold to the Port of New York Authority in the 1950's. By the end of World War I, the Todd Shipyard in the basin was the largest in the Port of New York and remained so through World War II. A key feature of the shipyard was "Graving Dock One.” Completed in 1866 the 730-foot-long dry dock was used by Robins Dry Dock until 1916, and then by their successor the Todd Shipyard Corporation until 1986. Leased to other companies the dry dock remained in use until 2005, when Ikea bought the property and paved over the Red Hook graving dock to make a parking lot.